The Samford district is one of the few places in South-East Queensland east of the great Dividing Ranges where you can see this charismatic bird. Sadly, the population seems to be in decline, but the cause in uncertain: possibly a combination of habitat clearance and ‘tidying’ (babblers prefer open woodland with a shrubby layer, and plenty of leaf litter and fallen timber) and likely predation by domestic cats. 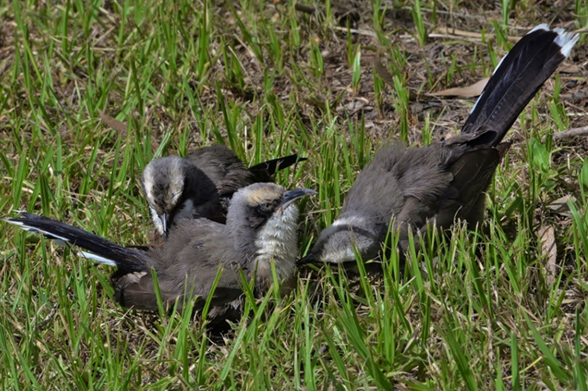 Grey-crowned Babblers are medium-sized grey-brown birds (just under 30 cm) with a black downcurved bill, grey crown and broad white eyebrow over a brown eye-stripe and white throat. They have a long black tail with a broad white tip. Look for distinctive rufous panels in the wing in flight. They live in active family groups, usually with a mix of adult birds (with pale yellow eyes) and immatures (brown eyes). They spend most of the time on the ground, turning leaf litter to find invertebrates, but will also probe the trunks and branches of eucalypts and other trees looking for tasty morsels. These are boisterous, noisy birds that love to play. They spend a good deal of time preening themselves and others in the group, so you may see several babblers lined up along a branch. They chatter to each other constantly using a contact call ‘chuk’, but listen also for the alarm call ‘skak’ when threatened. The complex song is sometime delivered as a duet, and ends with a loud drawn out ‘awoooo’.